Classically Liberal: Christmas: What you know that just ain't so. I used to like Christmas, as a holiday. Not anymore. I find the Christmas music annoying. I don’t mind it for a few days. But, since we seem to have started pushing Christmas sometime in August, the music quickly becomes annoying to me. Worse yet, a lot of the modern remakes of the songs are just pathetically awful. In addition, every year some film studio produces yet another “must-see” Christmas film. And then from the next year onward it is included in the growing array of Christmas films that clutter the airwaves crowding out some decent shows. You would have to start showing them in June just to get through the lot of them. Most are juvenile in nature and usually so sugar-coated that they induce a diabetic coma just from watching them. Even what used to be festive lights have become gaudy, gauche displays of questionable taste. 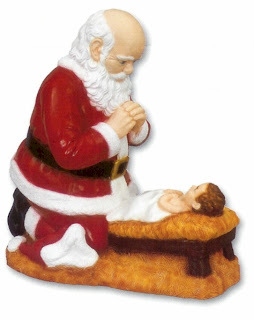 Surely the tackiest display I’ve seen was a plastic Santa kneeling before a baby Jesus. Apparently this awful mixture of conflicting myths is so attractive to some religionists, you can actually buy the display in a ceramic mold. The favorite, I must say, was one I saw where someone had a bevy of plastic pink flamingoes pulling Santa’s sleigh. It was just clever enough, and wry enough, to amuse me. But in general, I’ve ceased to be a fan of Christmas. The Religious Right has tried to turn the holiday into a mandate for their agenda. If you don’t say “Merry Christmas” even to people who don’t celebrate it, you are considered some sort of communist, or worse. What amuses me about Christmas, however, is the utter stupidity of people. There are a lot of people who drone on about “the true meaning of Christmas” which usually means something to do with their religious belief. The “true” meaning of Christmas just happens to be whatever it is that they want everyone else to believe. Yet Christmas is the one holiday that has more false assumptions about it than any other holiday. The reality is that what most people know about Christmas just ain’t so. For example, most Christians have no idea that the Nativity story that they repeat, year in and year out, is a collection of several Nativity stories pieced together from the gospels. Nor do they realize that these stories contradict one. A careful editing, in most church services, however, weeds out the conflicts and makes the story appear to be a coherent whole. The Christmas story is based on the individual stories of the four main gospels: Matthew, Mark, Luke and John. These books were not necessarily written by the authors to whom they are ascribed. In truth we don’t know who wrote them. But we do know that the four stories don’t agree with one another as to the facts. The Christmas story, as presented in most church pageants, is actually created by cherry-picking sections from the different gospels and combining them. For example, we are told that Herod was informed that a “king” would be born so he had all the new born babies slaughtered, but Jesus escaped. The odd thing is that not one contemporary record of this genocide exists to substantiate it. Josephus wrote about Herod in his Antiquities of the Jews, but he never knew about this incident. Three of the gospel writers seemed to either not know of the mass killing or thought it was unimportant. Only Matthew recounts it, Mark, Luke and John seemed to be unaware that it took place. Based on historical accounts Herod would have been already dead by the time that Jesus was born. Two gospels say that Herod was king. But Luke says that Caesar Augustus issued an order for a census and it “came to pass” when Quirinius was the governor of Syria. Quirinius, or Cyrenius as he is also known, only became governor 10 years after the death of Herod. The history by Josephus showed that Herod had died and was replaced by Archelaus, who was considered too oppressive by Caesar and removed from office and replaced by Cyrenius. The gospels contradict themselves on this matter. Luke said the Romans required the people to return to their hometown for the census. But Rome never did this. Considering the large territory ruled by Rome such a requirement would have been noted somewhere. Only Luke seems to believe this was the case. Rome exerted control over Judea but through a client king. So while the gospel account says that Rome held the census to impose a tax, Rome itself didn’t impose taxes. It collected revenue from the local king who had control over taxation, not Rome. A Roman census and/or tax would not have included Judea. In addition Rome would not have required women to be counted. The man was the legal head of the household and he would report the numbers for the census without the woman or children being required to do so. Even if the Romans required individuals to travel to their hometown, something impossible in an empire the size of Rome, a woman would not have done this, especially one on the verge of giving birth. Riding a donkey for that length of time while pregnant, would probably have resulted in a miscarriage. Luke says that Jesus was born in Bethlehem, was born in the manger and was visited by the Wise Men in the manger. But Matthew says the Wise Men came to see Jesus in a house, not in a manger. Matthew wrote that Mary and Joseph lived in Bethlehem and moved to Nazareth. Luke says they lived in Nazareth and moved to Bethlehem. Perhaps they passed themselves on the way. Early Christians didn’t think Jesus was born in a stable or in a house. They preferred the story that he was born in a cave. Origen wrote, “there is shown at Bethlehem the cave where He was born and the manger in the cave where He was wrapped in swaddling-clothes.” The Church of the Nativity is, in fact, built over a cave that is alleged to be the spot of the birth of Jesus. To complicate matters even more it appears that Bethlehem didn’t exist during the time period that Jesus was alleged to have been born. Well, actually there were two Bethlehems. Matthew and Luke say it was Bethlehem of Judea where Jesus was born, not the Bethlehem in Galilee. But archeological evidence indicates that the Judean Bethlehem didn’t exist at the time. Bethlehem of Galilee, however, wasn’t far from Nazareth at all and it did exist. Matthew and Luke seem to have been wrong on this matter. Mark apparently knew nothing about the virgin birth. And the oldest sections of the New Testament, those books ascribed to Paul, also are devoid of any mention of the concept. Luke talked about shepherds but Matthew seemed to not know they were around at the time. Even the date of Christmas has problems. Early Christians simply did not believe that Jesus was born on December 25th. The birth dates they ascribed varied greatly, ranging from January to May. December 25th was the date that the winter solstice was celebrated—when the days got longer. True the actual solstice is on the 21st but the crude instruments of the day only detected the longest day on the 25th and it was the traditional date for celebration. Many of the pagan sects claimed that a god-man was born on Dec. 25th. The god-man Attis was supposedly born of a virgin on Dec. 25th. In Greece the god Dionysus was said to have been born on the 25th as well. The Egyptians celebrated the birth of Osiris on that date as was the Persian god Mithra. The Babylonians did the same. These dates were picked for the birth of gods simply because it was the date when they noticed the days getting longer. The Roman Saturnalia was traditionally celebrated from Dec 17 to 23 but Emperor Aurelian decided the 25th would be the day to celebrate everything. The Catholic Church ultimately picked December 25th, to celebrate the birth of Jesus, because it was date that had widespread cultural acceptance. People already celebrate the birth of a god-man on that day making it an easier sell. As I said: most of what you know about Christmas just ain’t so. posted by blog owner at 12/25/2009 07:08:00 AM DiggIt! Reddit Del.icio.us Slashdot It! Another cop who needs to be canned! Not given a chance to live. Wow: that was a shocker.